Gigi’s on Fairmount opened in December 2013 and has been such a hit that it has already expanded and opened Gigi’s After Dark. That said, it is still tiny, although the patio in the summer helps somewhat. It only seats about 45 people. 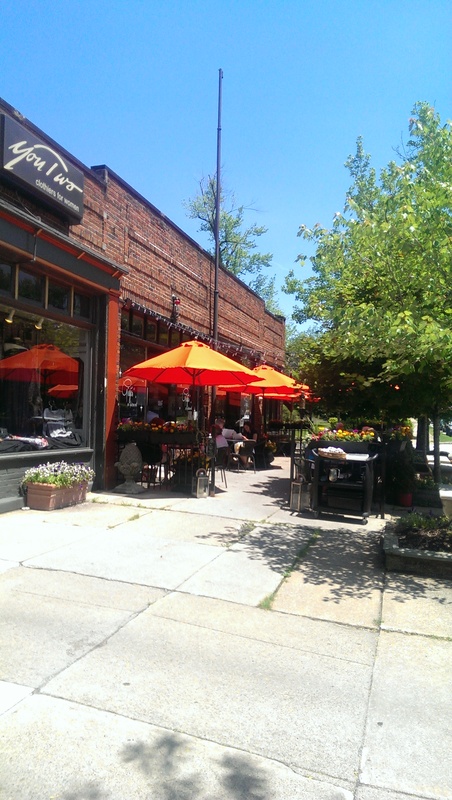 It is located in the same little shopping strip as On The Rise Bakery. It used to be a flower shop, and the owners put a lot of time and money into installing a kitchen and making the dining area appealing. 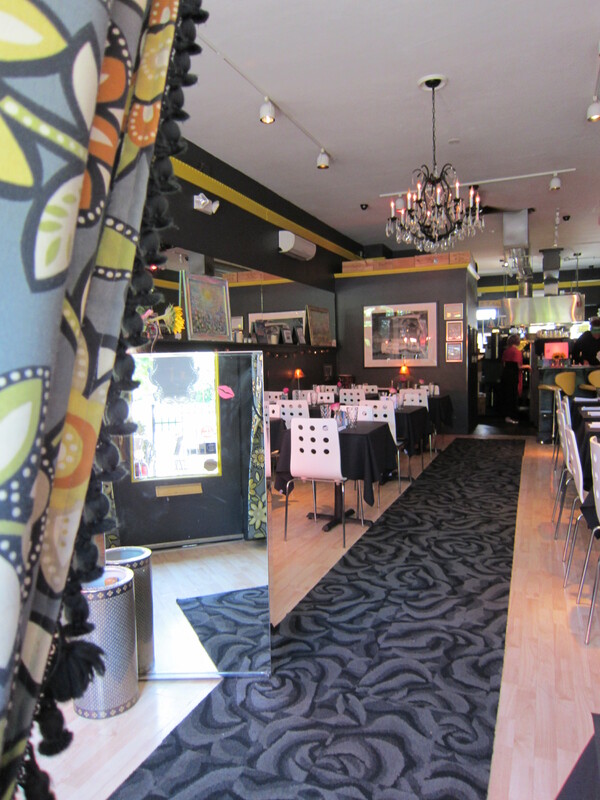 The decor is cozy and intimate with crystal chandeliers and small tables, and it reminds me of a little French bistro. 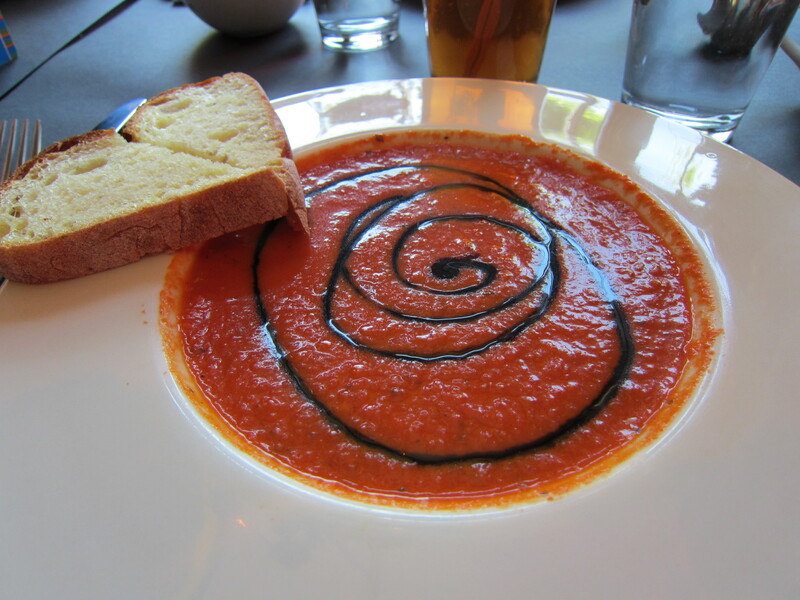 The food is fresh and unique, and the waitstaff is friendly and welcoming. They also have one of the best bartenders in Cleveland, although I have only come here during the day for lunch because it tends to get crowded at night. I’m thrilled that they are so successful. On my first visit I ordered a soup and a panini. 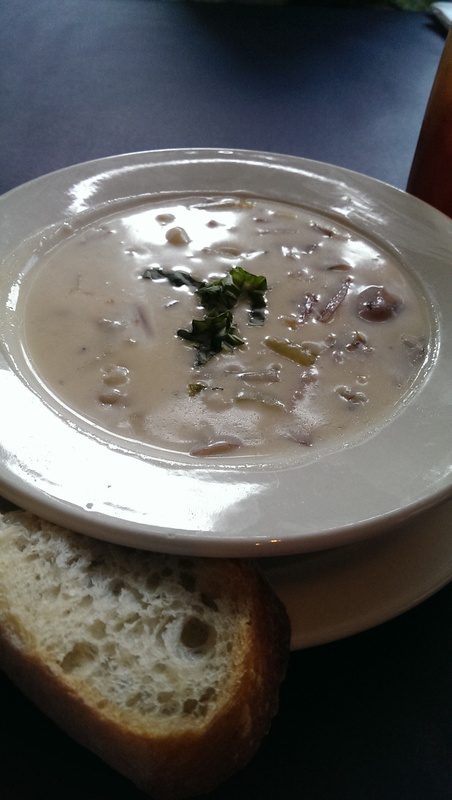 The soup of the day was a potato chowder that was out of this world delicious. It was creamy with nice chunks of potato and perfectly seasoned. It warmed me up and made me hungry for more. I seem to be drawn to the same thing, because the second time I went I almost ordered the exact same sandwich. I ordered the turkey panini with brie, apples, and fig chutney. The turkey is house brined and roasted and was really succulent. It paired really well with the brie, apples, and fig chutney and was a taste explosion. The panini was not under or overcooked, and the b rie was sufficiently melted to mix with everything else. I loved it. During my second visit I decided to order their signature bruschetta board. After going back and forth I finally decided on the brie and apple compote, smoked salmon and boursin with capers, trout pate with radish and crumbled egg, and the mushroom and caramelized onions. 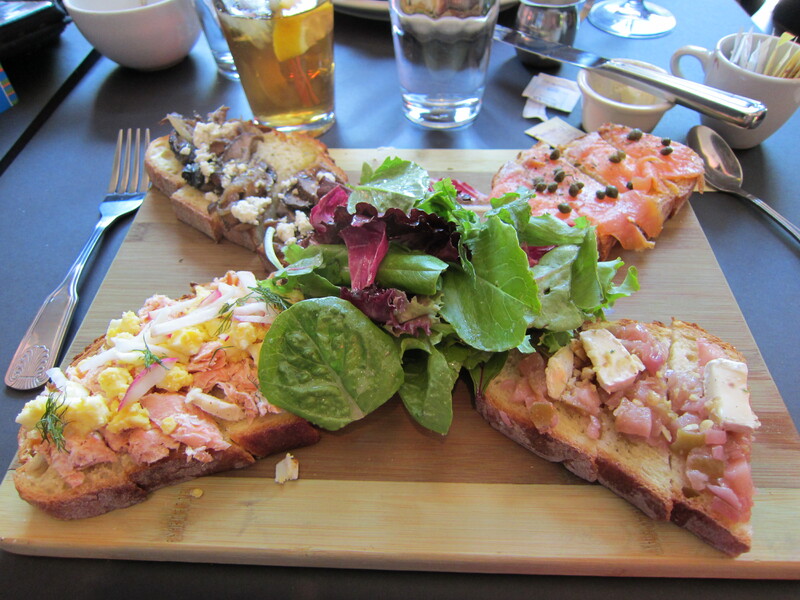 I loved all four, but my absolute favorites were the smoked salmon and the mushroom bruschetta. I also love the idea of the trout pate, but it was more chunks of trout than smooth, creamy pate. You don’t see many places serving trout. The bread was not toasted, but it stood up well to the toppings. The salad was lightly dressed with a light oil and vinegar dressing, and was well-executed if a little bland. It wasn’t anything special (just lettuce and dressing), but it was a nice palate cleanser. My friend, who is a vegetarian, was thrilled to see so many vegetarian choices. All three soups that day were vegetarian. 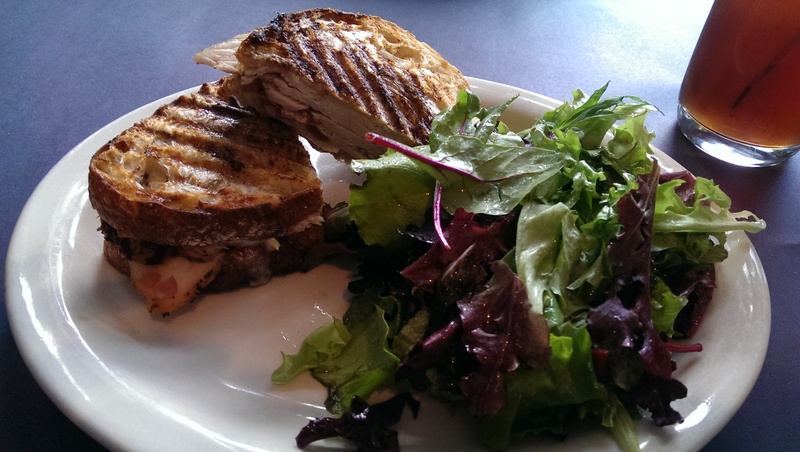 She ordered the Charline panini, which features avocado and sharp cheddar, and enjoyed it. My friend lived on the edge and ordered a light and fruity wine to go with her lunch at 11 a.m. Day drinking is where it is at. She let me have a sip and it was really nice. 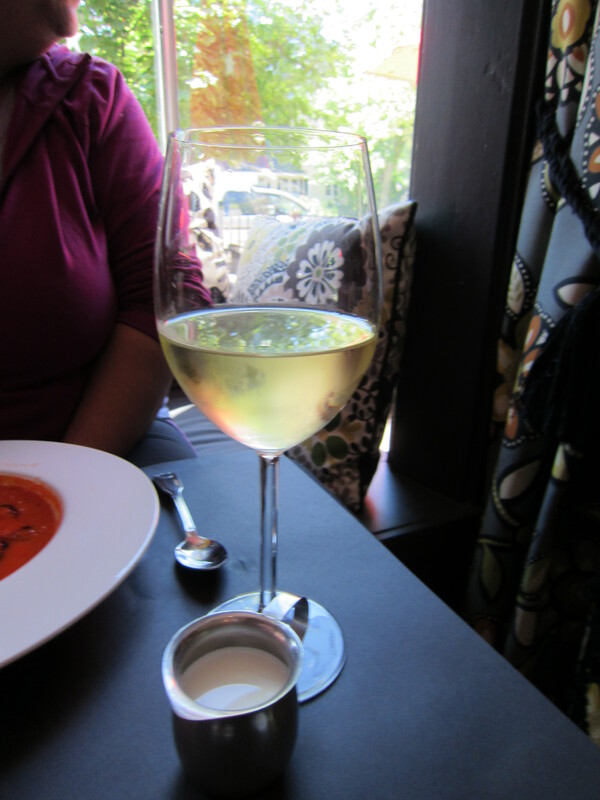 I would definitely order it a little later in the day to pair with the delicious offerings. If you haven’t been to Gigi’s yet, what are you waiting for?